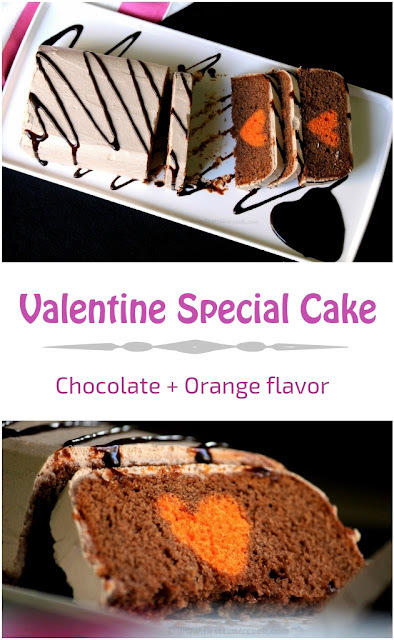 Valentine special cake - a heart in every slice of cake. Sounds interesting, isn't it ? I can assure this'll be a better way to show your love on Valentine's Day for your loved ones. Here I have used two different flavors of cake. One is orange and other one is of chocolate flavor. Orange and chocolate flavors are a unique combination. Grease a loaf tin with butter or line up with a butter paper. Sift all purpose flour, salt and baking soda in a bowl. Keep aside. In a mixing bowl, take sugar, milk, orange essence and oil. Whisk till sugar is melted. Then add orange zest and mix well again. Next add in shifted dry ingredients, fold gently. Pour the batter into the greased loaf tin and bake for 35-40 mins. Take out from oven and let the cake to cool down for 10 mins in the tin. Then invert on a cooling rack and allow to cool down completely. Once the orange cake cooled, cut into slices. Then using a heart shaped cookie cutter, cut out the cake slices. Keep aside. Preheat again the oven to 180º C.
Grease the loaf tin with butter or line up with a butter paper. Sift all purpose flour, cocoa powder, baking powder and baking soda in a bowl. Keep aside. In a mixing bowl, take butter and milkmaid. Mix well. Then add vanilla essence and mix well again. Add some dry ingredients to the milkmaid mixture and then add some aerated soda and mix well. Repeat, alternatively dry ingredients and aerated soda till both are used up. Now spoon 2-3 tbsp of the cake batter into the bottom of the loaf tin and spread evenly. Place gently the heart shape cut-out orange cake pieces (side by side without having any gap in between the cake pieces) having the pointed end of the heart shapes upwards on the batter layer lenghthwise from one end to other end of the loaf tin. By placing side by side and without having any gap in between, the heart shape orange cake slices will look like a heart shape log. Make sure to leave space at both end of the log for rest of the chocolate cake batter. 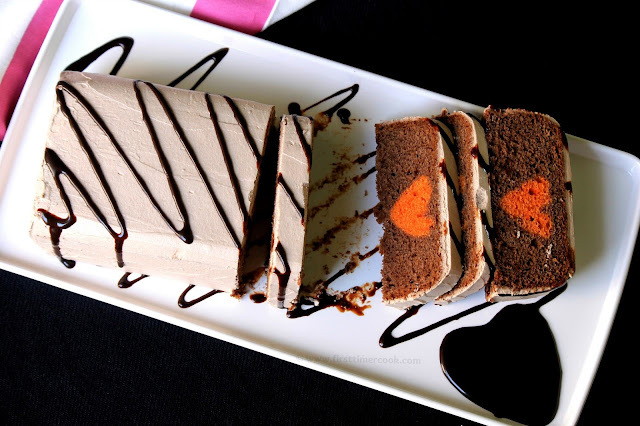 Next gently spoon rest of the chocolate cake batter around and over the heart shape orange cake log so that the log is covered fully. Now bake for 35-40 mins. In a mixing bowl, take icing sugar and butter. Mix using electric whisk on low speed until well blended. Then add cocoa powder, vanilla essence and whipping cream. Mix again on low and gradually increase speed to make frosting smooth and spreadable consistency. Now take the chocolate cake on a serving platter (must be bigger than the cake base). Then using a spatula, apply the buttercream frosting on top and sides of the cake and spread evenly. Keep in refrigerator for 20-30 minutes, so that the frosting'll well set. Now drizzle chocolate sauce on top of the frosting in preferable design. 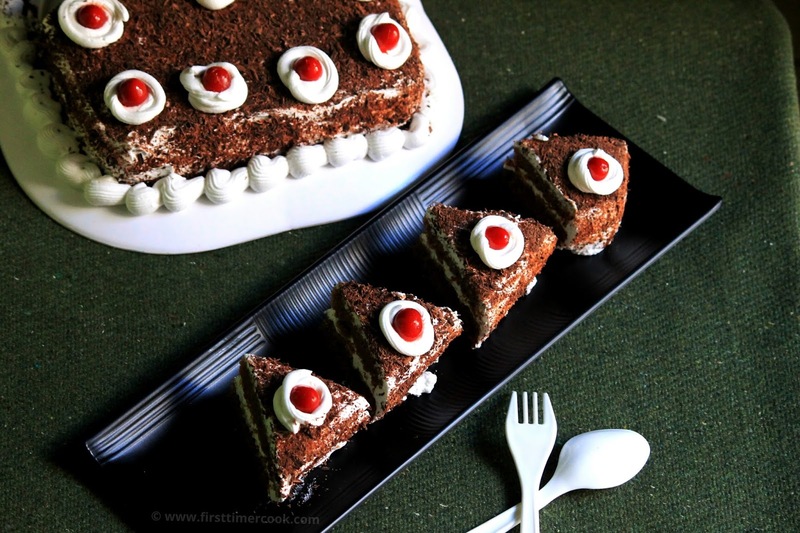 Serve by slicing the cake so that the cute heart inside will be visible ! Frosting part is purely optional. 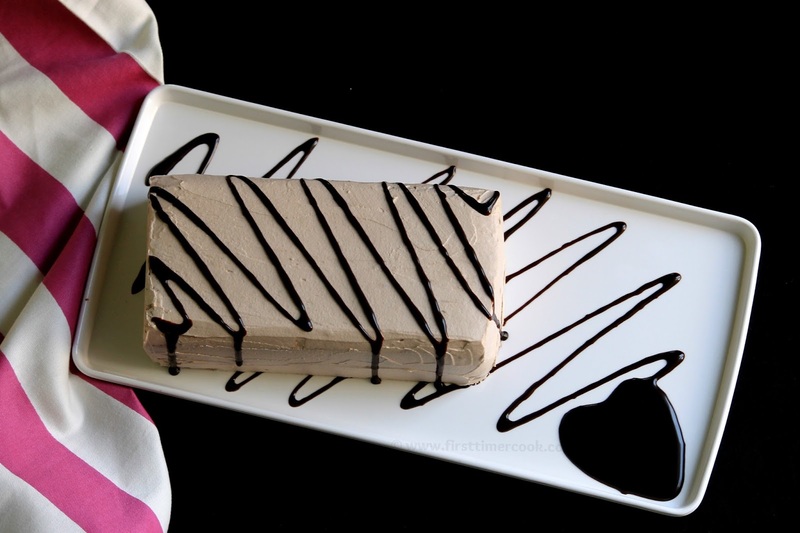 If not interested to make frosting, then grab as it is. Hi Sasmita, I wanted to try this recipe. It looks awesome but was wondering about the size of your loaf tin. I am so glad for that. Mine is 9 inch loaf tin. Keep blogging. You are really doing a great job. I hope you will also like my blog where I am exploring my small knowledge about Rich Indian Culture By Sharing India Adventure Tourism Posts & Vegetarian International famous Recipes. indiatourfood.com is the link of my blog. I hope you will soon visit & also give me comment on my any post. Thanks again. I will soon check your blog again to read more yummy recipes which i don't know currently. This cake is spectacular and is a beautiful surprise for the special one...totally wowed! Can you help me in placing of heart shape orange slices? I’m little confused over there. Also I have readymade whipped cream then can this be used in frosting? If yes then how to add butter and cocoa powder in it? In the greased cake tin, first put 2-3 tbsp chocolate cake batter and then spread evenly so that the bottom layer of the cake tin is covered with chocolate batter. 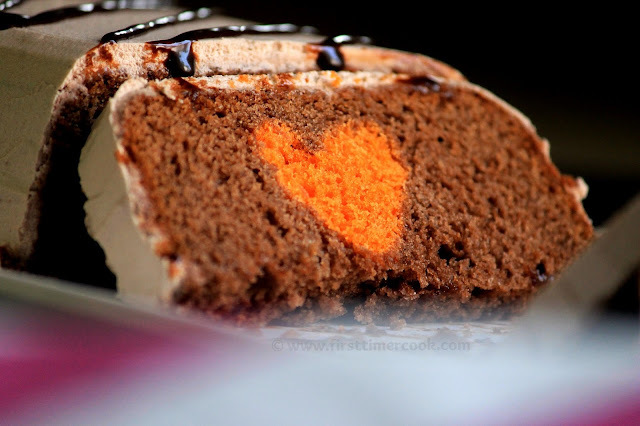 Next over that thin layer of chocolate batter, place one heart shape orange cake slice with the pointed end of the heart upward. Place another orange cake slice adjacent to the previous one with the pointed end upward (keep in mind that there should not be any gap in between both orange cake slices). Similarly place some more orange cake slices till the end of the cake tin in one line. And for the ready made whipped cream, first whisk rest ingredients using a whisker. Then finally add whipped cream and gently fold for everything to be incorporated well. What a fantastic idea! This is the second hidden heart cake at Fiesta Friday this week and I'm loving it. What a great idea. Thanks for sharing at Fiesta Friday.